With the beginning of January, the construction crew began working in earnest on the final stages of the major expansion of the Hanmer Valley Shopping Centre. With the outside walls up and both V & S Department Store and Mayfair Office Supplies vacating their former spots, the time has come to get the inside ready for Hart Department Store. The parking lot along the East Wing has taken on a whole new appearance as the outside walls for the new Hart Department Store went up in November. Construction is well on schedule for a March 30 Grand Opening. Representatives of Hart Stores Inc. were in Valley East on Thursday to go over plans for the opening of their 2nd Ontario store at the end of March in the Hanmer Valley Shopping Centre. 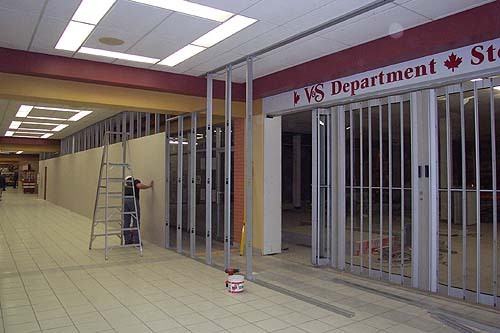 Bobby Alfano, in charge of site construction, and Michel Lussier, Director of Store Operations for the 66 store chain, were very pleased with the progress and are putting the final touches in place for the Grand Opening on March 30, 2005. Hart Department Stores will open three new locations in a matter of a few days at the end of March. Besides opening in Valley East , they will also be welcomed in Whitby and another community in Quebec , bringing the total number of stores in the chain to 69. Plans are also under way to open in at least two or three more sites in Ontario in 2005, including Espanola. The 30,000 square foot department store is expected to change the way people shop in Valley East and Capreol from the moment it opens its doors. With a tremendous selection of both soft and hard goods, at prices that are guaranteed to be as low as or less than their competition, residents will discover that the convenience of local shopping need not mean higher prices. The investment of over $1M to expand the Hanmer Valley Shopping Centre to accommodate the store is proof positive that landlord, Val Mazzuca is confident that the communities of Valley East and Capreol are going to continue to be one of the fastest growing areas in this part of the province. Robert Kirwan, Marketing Manager of the Hanmer Valley Shopping Centre is working directly with Michael Hart and Michel Lussier to make sure that the people of the Sudbury area are kept up to date with the status of the store as the opening draws close. Whenever a Hart Department Store opens, it is a major event in the community. Michel Lussier has indicated that this grand opening will make a lot of people stand up and take notice as they realize why Hart Department Stores are gaining so rapidly in popularity. With the Price, Quality and Selection of a big box store, Hart Stores have become the preferred department store for residents who discover that they can "have it all" without having to deal with the lack of parking and traffic congestion found at the larger, more central shopping sites.